Genzyme, a leading biotech company that made our Most Innovative Companies list last year, makes its (fictional) film debut today, although, according to a recent Reuters article, the company isn’t necessarily thrilled about it. 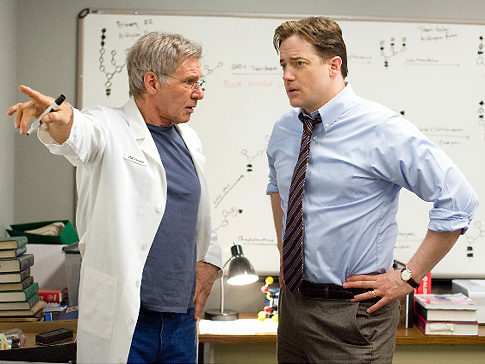 For one, the movie in question, Extraordinary Measures, stars Brendan Fraser and Harrison Ford. Together. Secondly, it doesn’t exactly portray the company–called Zymagen in the film–in a positive light (Zymagen buys out the start-up run by Fraser and Ford’s characters and cancels their project in favor of its own). Last March, we praised Genzyme for its innovative biomedical treatments and a projected 20% increase in annual earnings. But shortly after, the FDA shut down one of its manufacturing facilities over contamination issues–really, who saw that coming?–and its push to ramp up production of its Pompe disease treatment (the very treatment depicted in Extraordinary Measures) combined with a wash of (arguably deserved) bad press left the company overextended. Its stock price dropped 26%. Now, just as Genzyme gets back on track, comes a movie portraying a thinly veiled version of it as the bad guy. Which would be pretty inopportune if Extraordinary Measures wasn’t on the fast track to midday showings between With Honors and Six Days, Seven Nights on the Hallmark Channel.